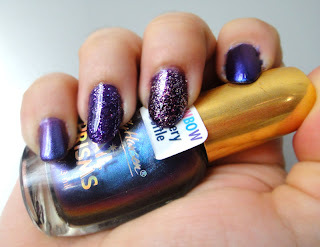 Purple, glitter and duochrome! Yes, please! It's a lovely Sunday and time for another post too. 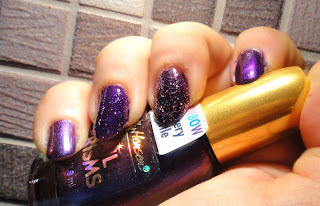 Today I will show you the mani I did for my recent trip to London. 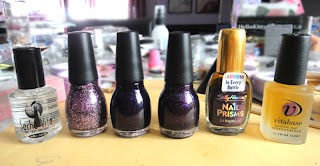 I was going through my stash and found a bunch of Sinful Colors polishes that I haven't used, plus I recently randomly discovered Sally Hansen's Garnet Lapis at a local store so I decided to combine all these in a manicure and see what will happen. And this is what I got. 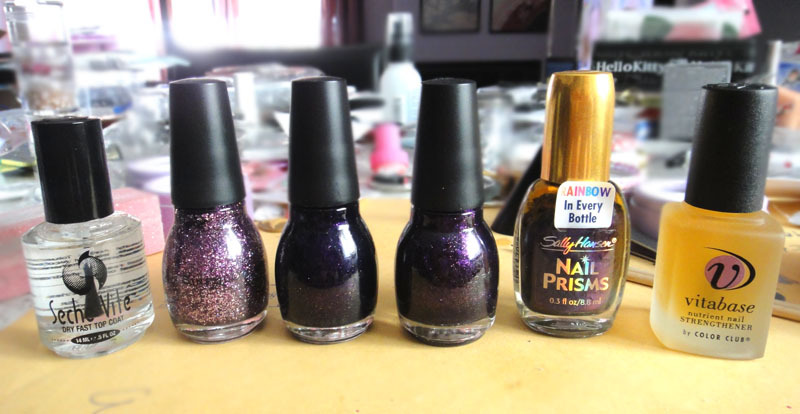 Here are all the nail polishes that I used. From left to right, Seche Vite top coat, Sinful Colors I Miss You, Daddy's Girl and I Love You, Sally Hansen Garnet Lapis and Color Club Vitabase. First I painted half of my nails with Daddy's Girl and half with I Love You. 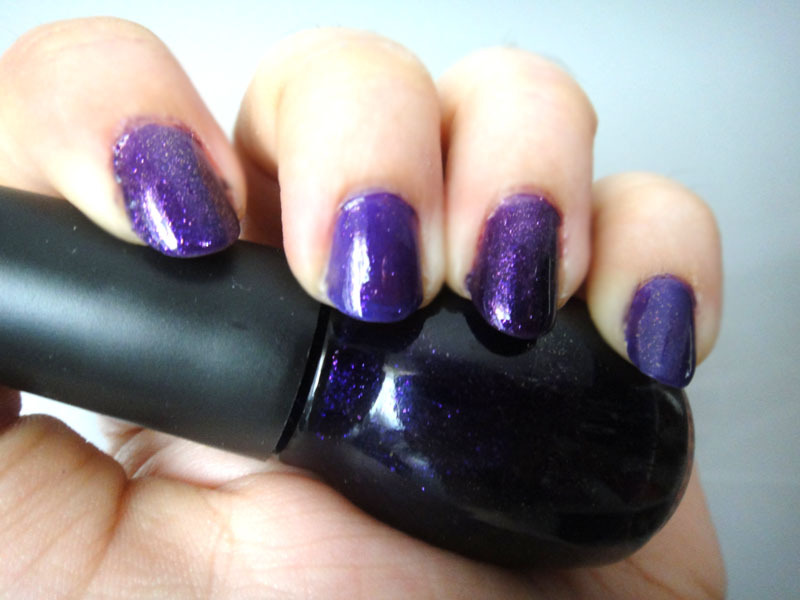 The colours look quite similar in the bottle but on the nails Daddy's Girl is a more blueish purple (it's on my pinky and middle finger). 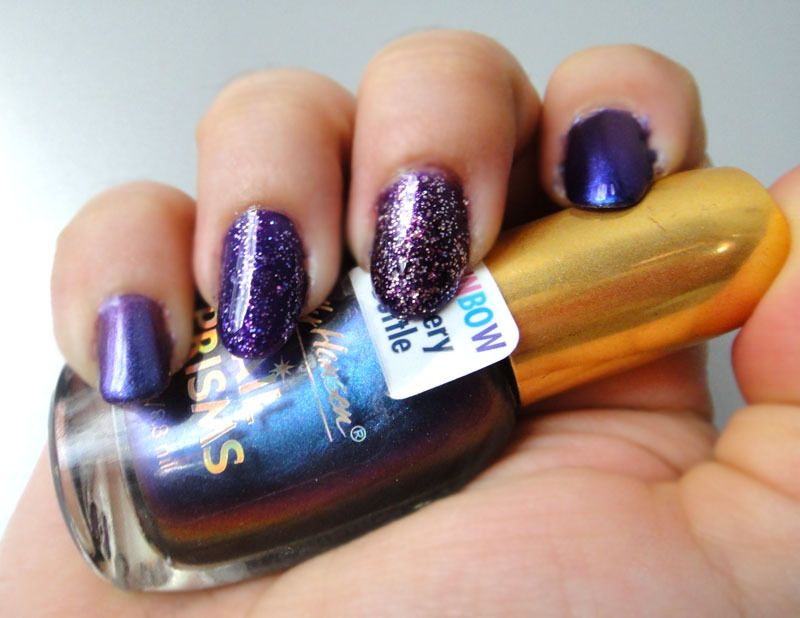 Then I painted some nails with I Miss You and some with Garnet Lapis. Topped everything with Seche Vite and I was ready to go. It was very interesting seeing how differently I Miss You looked on Daddy's Girl and I Love You. Garnet Lapis on the other hand looked the same over each colour. 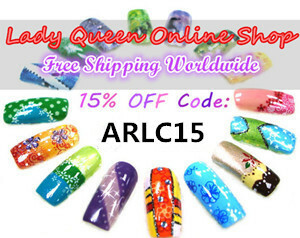 Recently I do not have enough time to do my nails which is why you haven't seen a lot of nail art or stamping from me, but I found that combining different colours and finishes is another way of spicing up a manicure. Also this one lasted almost 10 days with no chipping whatsoever, even when I was dragging my overstuffed suitcase at the airport! On another note I would like to let you all know that my giveaway is now closed. I now need to verify and count the entries and then I will announce the winners. Also as during my giveaway, my blog passed the 1000 followers mark, I picked up a couple of special items from London that will be a 1000 follower special prize. The winner of that will be picked from all my current followers and will be announced along with the winners of my giveaway. Perfect for a night out =) I liked it. Nice look ;) Love to use chrome for Konad. Awesome wear time! I've never had a mani that long! It's very pretty! I'm the same as you, sometimes when I don't have too much time, I just like to change my nails slightly and I get a whole different look. 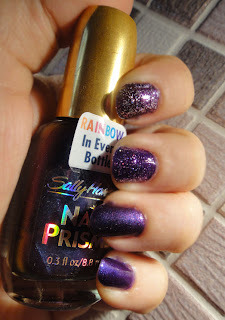 I love Sally Hansens' nail prism! u used a lot of polishes and the effect is great! Such pretty colours. You have a wonderful blog by the way, I will definitly be checking back to read more of your posts! Good luck with it (although I am sure you don't need it). I love how you combine different colours and finishes and it always turns out pretty!